For a copy of the booklet for the Nine Days of Prayer (26th May to 3rd June 2017), please click here. Alessandro Bianchi Organ Recital: On 2nd July at 4pm we had International Concert Organist Alessandro Bianchi performing at St. Michael’s Church. He is an award winning organist and Artistic Director, who has performed in many International Organ Festivals and also previously at St. Michael’s. Please click here for a pdf version of the programme, which contains more information about Alessandro Bianchi. We ran two themed Holiday Clubs at St. Mary’s (each over a course of a week) in August. This year we had The Horse and His Boy Narnia week, which took place 7th to 11th August 2017. Please click here to go to our Narnia week page. We also had Guardians of Ancora taking place 14th to 18th August 2017, and a special Holiday Club Service (at St. Mary’s) on 20th August 2017. Please click here to go to this Holiday Club page. On 9th September 2017 was The Friends of Kent Churches Ride and Stride event. Please click here to view the information flyer for this event. On 16th October 2017 we had a beautiful Licensing Service for our vicar, Rev Lesley Jones. Please click here if you would like to view the order of service. On 29th October 2017 we had an All Age Harvest Service and Christening, during which donations of filled backpacks for the Mary’s Meals Backpack Project were blessed. More information about this project or about Mary’s Meals can be found on their website https://www.marysmeals.org.uk/get-involved/campaigns/the-backpack-project. On 23rd to 25th November 2017 we held our 4th Annual Christmas Tree Festival at St. Michael’s. Displays of decorated Christmas trees, refreshments, stalls and even (on 25th November 2017) Father Christmas. Please click here for the poster and here for the programme. On 16th December 2017 we are held a Messy Church Christmas Party. Please click here for a pdf version of the poster. This was great fun as we started off with games followed by the real Christmas story from one of the shepherds as we sat round a campfire, made nativity sets and party hats, sang, prayed and had a yummy party tea. For details of the other Advent and Christmas services held at St. Michael’s in 2017 please click here. To view the God with Us booklet that we used over Advent please click here. To view the Advent booklet given out to Little Saints please click here. On 10th February 2018 there was an Indoor Boot Fair at St. Mary’s. A PDF version of the poster is available here. Thank you to everybody who helped at this event where we managed to raise £250.00. On 24th March 2018 at 7:30pm The Freegard Singers held a concert at St. Michael’s Church. Tickets were £7.50 on the door and there was a variety of music with something for everyone. Please click here to view the poster for this event and here to view the programme. We had an update from World Vision, through whom we sponsor Rishi. If you would like to read this update please click here. During Holy Week we had some special services, please click here for a pdf version of the poster detailing these. On 31st March 2018 at 4pm, we had a special Easter Messy Church, a pdf version of the poster is available by clicking here. To view the booklet we handed out and also reviewed as part of our Lent Groups please click here. We received an update from World Vision about our sponsor child, Rishi. Rishi is doing well and is happy and healthy. A video of Rishi saying hello and thank you in his own way is available to view on our Facebook page. During the 11th to 19th May 2018 we had 9 days of prayer and Novena services using the themes and reflections in the Novena 2018 booklet, to view this please click here. 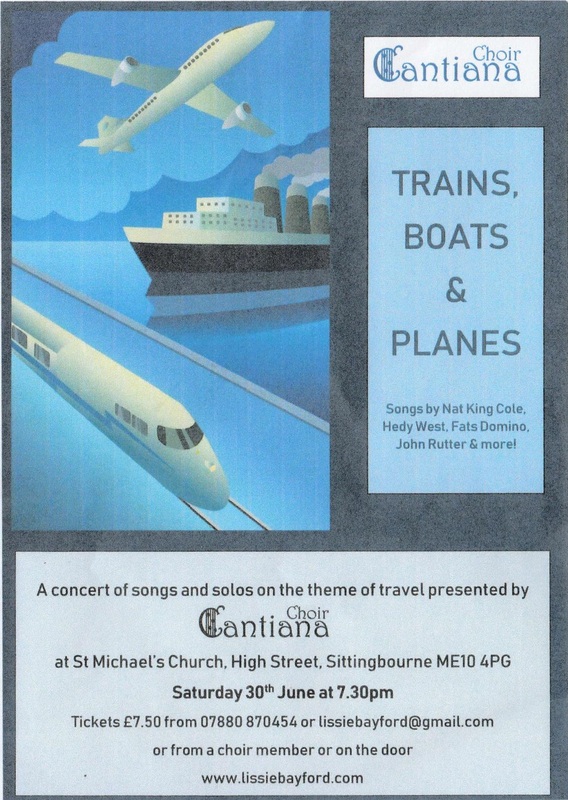 On 30th June 2018 at 7:30pm Cantiana Choir held a concert at St. Michael’s Church called Trains, Boats and Planes. Following the theme of travel, in a concert of songs, duets and solos, interspersed with readings, they performed songs by Nat King Cole, Hedy West, Fats Domino, John Rutter and more! This was their first time in concert at St. Michael’s since 2013. Amongst the many popular songs and musical styles to enjoy was The Skye Boat Song, Chatanooga Choo Choo, Leaving of Liverpool and Fly Me to the Moon. Please click here to view the event poster and here to view the programme for more information. This year St. Michael’s took part in Sittingbourne’s Community Wardrobe, which was at St. Michael’s on Friday 17th August 2018. For the information poster please click here. Our Saturday Recitals returned to St. Michael’s after their summer break on 8th September 2018, where our recitalists were Music With Reeds.